Proudly Coloured Comedy – “BrainOu – BrainOu” returns to Emperors Palace on October 29, 2016 with another stellar line-up of ‘proudly coloured’ comedians. Apt timing too, with the hashtag #coloureds recently trending on Twitter as South Africans tried to claim their piece of Wayde van Niekerk’s 400m Olympic victory. The well-known comedy series adds colour to the stage at the Theatre of Marcellus with Kurt Schoonraad, Joey Rasdien, Roni Modimola, Neil Green, Farhan Esat, Mel Jones and Andrew Hughes. A community largely plagued by stereotypes, these guys are not afraid to tell it like it is. 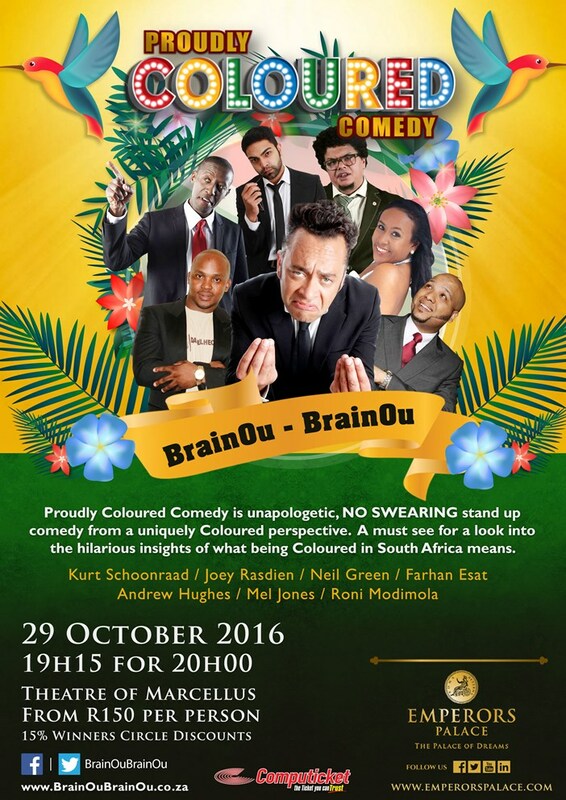 For one night only, these comedians will share insights from a uniquely coloured perspective, taking diverse audiences on a hilarious journey of what it actually means to be a coloured in South Africa. The show is an opportunity to re-write coloured history and entertainment in South Africa, showcasing a proudly coloured nation through a series of carefully crafted comedic narratives. “No swearing allowed”, the show promises loads of family friendly fun and endless bouts of laughter. Taking the lead as MC for the evening is Kurt Schoonraad, one of South Africa’s most recognised stand-up comedians. Hailing from Mitchell’s Plain, which was highly influential in developing his sense of humour, Schoonraad is well-versed in all things “coloured”. The pioneer behind Cape Town Comedy Club, the comedic personality is determined to keep the comedy scene in this country alive and growing, while remaining at the forefront. No stranger to the comedic industry, colourful personality - and headliner for the night - Joey Rasdien has earned the title of "The Thinking Man's Comedian" - his comedy is thought-provoking and intellectual. A delight to watch, Rasdien never disappoints. Roni Modimola is a regular at major comedy venues across the country. Known for his dry but witty comedy style, Roni adds a slice of charm to this year’s line-up and is sure to keep the audience glued to their seats. Comics Choice Award winner for “Newcomer of the Year 2015”, Farhan Esat, will add a burst of energy to the coloured comedy crusade. The Zimbabwean born Esat made his professional debut in 2014 and has become a regular performer on the local stage. He opened for Riaad Moosa’s "Best of Riaad Moosa" shows in Lenasia, and has performed at prestigious venues across the country. In October 2014, Esat was a semi-finalist in the Montreux (Swiss) International Comedy Competition. Another Mitchell’s Plain native, Mel Jones describes herself as “the favourite” of three siblings. As one of only a handful of female comedians in the country, the award nominated comedian continues to uplift and inspire young people in coloured communities in Cape Town and similar surroundings.